What did you all think of the episode? I thought it was way better than last weeks. So much DRAMA! I thought Chuck was looking really good last night (style wise I mean). I love his tie from his dad, suit, oxfords, etc. 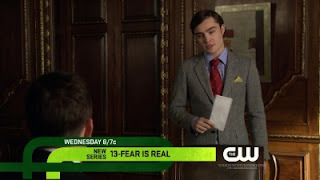 Great episode..i LOVED the black lace dress blair was wearing as well! is it bad that I'm swooning over bad uncle jack?!? Chuck just looks really sketchy to me. It's something about his eyes that makes him look slimy. 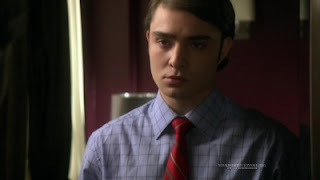 I even think he looks that way when he's NOT dressed as Chuck. I know a lot of people think he's hot but, I just get the creeps from him! Ohmygosh, I didn't see the episode. I like college basketball too much and chose that instead. But those images make me so excited to watch! You are right -- Chuck's hair looks good that way. I agree with you that his trench coat was too feminine. And Blair looked beautiful! Chuck is amazing and beautiful. Blair, as always looked gorg. I thought the episode was awesome. I knew there had to be something more to the whole adopted son story, and I can't believe those shady people lied! I can't wait to see what comes of that. Also, I wish Blair and Chuck could just be happy for ONE episode. It's killing me. I loved it. I think they are setting it up for the "Darker Chuck" to come up. He will be up to something. I can't stand his Uncle, the same actor is on Dexter and he annoys me there too. My friends and I thought the same thing about Chuck's jacket! Way to feminine for a guy. ohhh last night was intense! I can't believe Lily and Rufus! 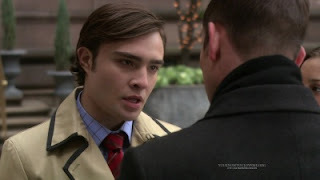 and Blair standing up to Chuck! so much drama! I need to catch up on the last two episodes. I haven't had time to watch! 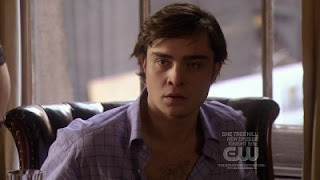 I agree about Chuck - he looks so much better disheveled. i agree on the hair. i love the messy look. I haven't seen GG yet. I was on the road last night. LOVE the cardigan! 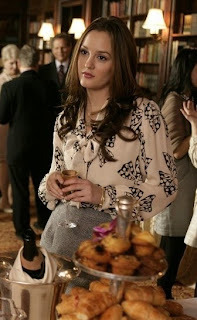 I love the Chloe skirt Blair was wearing!! 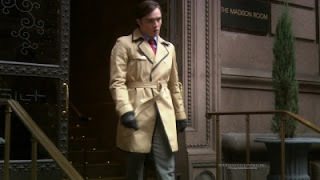 Oh my gosh, I was thinking the EXACT same thing about Chuck's trench coat! I mean, come on, with all the lovely options (Burberry, hello? )....oh well! And yes, her outfit at the brunch was to die for! A great episode! Hey! I'd love to hear more about the DC meet-up! Thanks for the invite! I am semi-close by, if I'm visiting home for the weekend. It's a possibility so don't count me out yet! That blouse is by Milly! It's on sale almost everywhere now. Go snap it up! Loved the episode. I thought Chuck looked great. Blair looked stunning in the black dress she wore when chuck cancelled dinner with her.